This recipe is adapted from one of my favorite vegan blogs (Oh She Glows) – which you should definitely check out. The sauce is also amazing on zucchini noodles for a refreshing summer salad! While your pasta – whatever kind you like – cooks, make the sauce. Cuz Avocados turn brown pretty quickly – this sauce is not a make ahead. OK, Kids, this is pretty simple. Place everything through black pepper into your food processor or blender. Actually, I use my “knock-off” magic bullet for this, cuz it works perfectly! If the sauce feels a bit thick, add 1 or 2 T of the pasta water to the blender. When your past is cooked, drain it and place it back in the pot. Add the avocado sauce and toss until combined. Put it on a big plate (or individual plates). 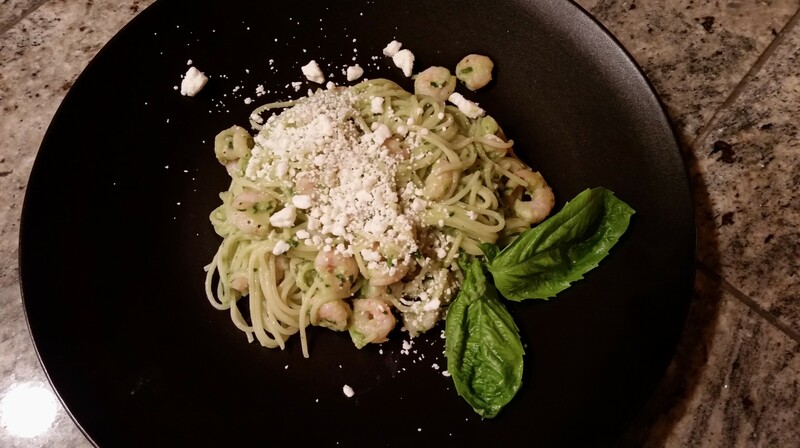 Top with lemon zest, shrimp and feta. Yummmmmmm. Oh my dears, this recipe is perfect with Morovino’s 2012 Pinot Noir. This is our new, go-to, honey-I-really don’t-feel-like-cooking-let’s-do-something-easy recipe! Super easy, super delicious and pretty healthy, Mrs. Vino loves poached salmon because it is basically impossible to over cook. First, let’s make the poaching liquid! In a sautese (That’s a saute pan with high straight sides – you must invest in one, my dears! Mrs. Vino uses it for everything. ), combine the water, tea bags, 2 T soy sauce, sesame oil, ginger, garlic, 1/4 c. wine and the juice of 1/2 of the lime (not the zest). Simmer liquid over medium low heat for 5 minutes. While the poaching liquid is simmering, salt and pepper the salmon filets/steaks. Remove the tea bags from the poaching liquid and discard. Remove 1/2 c. of poaching liquid (liquid only, no bits) and set aside for a minute. Slide the salmon into the remaining poaching liquid and cover. Simmer for 7 minutes. Put the poaching liquid in a very small saucepan over high heat with the second 1/4 c wine and 1 T of soy sauce and reduce down by half (this will become the sauce for the salmon). When the sauce is reduced, add the honey, Sriracha and the juice and zest of the lime and whisk together. Put the salmon on a plate and drizzle with a tiny bit of the sauce. Serve with salad and rice or a nice crusty French bread. YUMMMMMM. Really, one of Mr. Vino’s new faves. Mulled Wine Season is HERE! **If you don’t use Morovino Barbera, use a light, fruity red wine like Merlot, Grenache or Barbera. For wines other than our Barbera, start with 1/4 cup of sugar. Then taste and add more if necessary. Too much sugar is when Mulled Wine goes horribly, horribly wrong! The perfect warm fall beverage! Mrs. Vino would love to be able to serve something a little special for Halloween – like mulled wine. But, unfortunately, it’s usually way to warm on the Central Coast on October 31 to make that feasible. But now, we have the perfect concoction for your Halloween holiday – or ANY TIME! And it’s so so simple. Start with a pitcher big enough to hold at least 1 quart. If you have a small muslin tea bag, put the tea and the cinnamon stick in the bag. If you don’t have one, dump the tea and the cinnamon stick in the pitcher. Add the apple slices to the pitcher. Add the wine to the pitcher. Put in the fridge and let all the goodness infuse overnight. If you had a muslin bag, remove it and discard. If you didn’t then you need to pour the mixture through a fine strainer into another container. Serve well chilled. So perfect with pumpkin spice cookies!!! 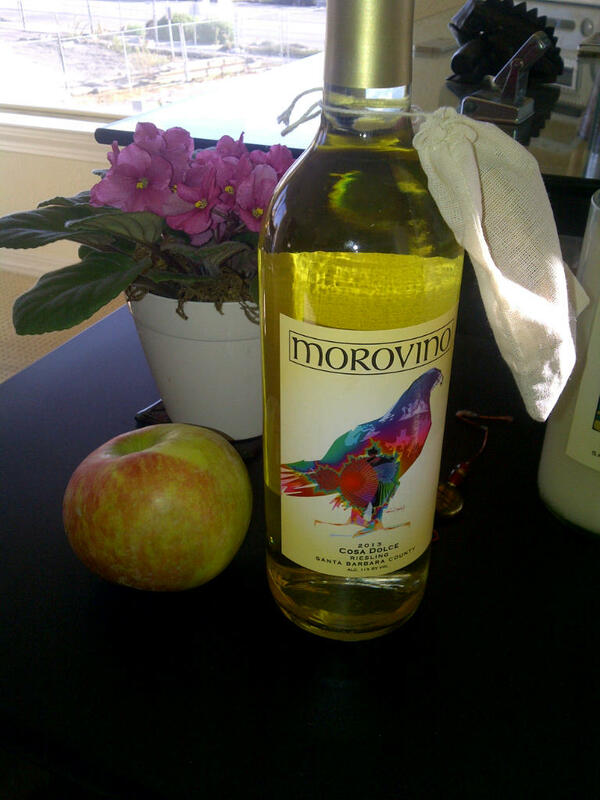 **If you don’t use Morovino Sangiovese, use a light, fruity red wine like Merlot, Grenache or Barbera. For wines other than our Sangiovese, start with 1/4 cup of sugar. Then taste and add more if necessary. Too much sugar is when Mulled Wine goes horribly, horribly wrong! Now that we have Cosa Dolce back in the tasting room, I’ve received several requests for my favorite summer party beverage: La Cosa Dolce Vita Bellini. This is light and perfect for picnics and summer barbecues. Enjoy! The Bellini was invented at Harry’s Bar in Venice and is generally made with Prosecco (sparkling wine). BUT, we think it is FAAAAABUUU when made with ice cold Cosa Dolce. Remove the peach pit, then cut the peach in cubes (including skin), and puree in your blender, food processor or mini-chopper. You want it very well liquified. Put 4 t. of peach puree in the bottom of a wine glass. Add 2T of club soda or ginger ale and stir well. Add the Cosa Dolce and the orange juice. Give another quick stir to blend. My one peach made about 4 glasses. ENJOY! If you want to do a pitcher of these, use 2 peaches, 1 bottle of Cosa Dolce, 8 ounces of Club Soda or Ginger ale and 2 ounces of orange juice—assemble as above. Then bask in the glory of your friends’ admiration. For a fun twist, try a frozen Bellini! Do these in full pitchers and Replace the fresh peach with 1/2 of a 10 oz bag of frozen peaches (I give my blender a break and let the peaches thaw just a tiny bit first). Kind of like a frozen margarita, only better! I’m always happy to accommodate a request from a tasting room guest! So here are two of my favorite GREEN aps for St. Pats Day. Chop off the bottom 2″ of parsley stems, then thoroughly wash and spin the parsley dry in your salad spinner. Give the parsley a rough chop, then toss it in the bowl of your food processor with all the rest of the ingredients. Whirl until you have a paste the consistency of pesto. Serve this with warm crusty sourdough. Make it the day ahead if you can – it’s even better the second day. NOTE: If you are into the “zen” of the chop, you can do all this chopping by hand but it takes less than 5 minutes to put together in the food processor. Bonus Points: If you have any left over, grab a Boboli thin wheat pizza crust. Top the Boboli or other flat bread (I am now loving “pocketless” pitas) with the parsley spread, then add sliced mushrooms, sliced tomato, grated mozzarella and diced up leftover Rotisserie chicken. Bake the Boboli per package directions. Absolutely Fantastic. Wash the basil in your salad spinner. Pick the leaves off the stems. Give the garlic a rough chop. Then put everything into your food processor and whirl it around. Put it on . . . anything. If you are looking for a lower calorie version of Pesto, use 1/4 C of evaporated non fat milk instead of the oil. It makes a nice creamy pesto that’s great over veggies! We wish you the happiest of holiday seasons! The Sangiovese Mulled Wine has been an enormous hit! Just in case you lost the recipe that came with your “Kit” here it is. 1/4 C. dried fruit (use dried cherries, dried plums, dried apricots, raisins – whatever you have, they all work! In your saucepan or crock pot, add the Sangiovese, water, sugar, spice package (take off the tag, but leave cork and leave spices in the bag) and raisins/cherries/etc. Simmer on low in a saucepan or high in a crock pot for 1 hour or more (don’t let it boil). More time is better. When warm, ladle it into small coffee cups, or heavy wine glasses and serve. Yes, the dried fruit goes in the glass too – yummy. Or put it in a thermos and take it to a football game (in a Thermos, strain the dried fruit out or it will clog up the pour spout). Or make yourself a pot and sip on it while wrapping holiday gifts sitting in front of the fire listening to Nat King Cole. Really, try it. 100% of visitors to the tasting room who have tried it have loved it! NOTE: If you don’t finish the entire pot of mulled wine just let it cool a bit, cover it and put it in the refrigerator. It’s delicious when reheated the second day! *If you use a wine other than Morovino’s Sangiovese, look for a low tannin Red wine and start with 1/4 Cup brown sugar then adjust to taste. Here are some reds that are usually low in tannin: Beaujolais, Tempranillo, Pinot Noir, Burgundy, Chianti, Merlot. Tie all the spices up in a piece of cheesecloth or in a coffee filter or put them in a tea ball and follow the recipe as above. 1. All by itself, sipping on a sunny deck. We will be enjoying the new rose on Oscar Night at The Vinos (heck, maybe we will even use a SodaStream machine to sparkle it – works great). As we munch our way through appetizers experimenting with matching foods to this awesome wine. Mrs. Vino loves Broccoli Rabe! So when it went on sale at her local grocer she went a bit crazy. This meant she had to find some new ways to prepare it and this is the easiest, most delicious Broccoli Rabe dish she has ever tasted! Preheat your oven to 400 degree. Cut the bottom 2” of stem off the Broccoli Rabe (maybe more, maybe less – depends on how big your bunch is. Basically you want to cut off any really woody end bits). Wash and dry the Broccoli Rabe thoroughly (I like to use the salad spinner – it’s a great tool for this). Put the whole stems of Broccoli Rabe in a large bowl and toss with 1/3 cup olive oil. You want to lube up the Broccoli Rabe really well or it will stick to your baking sheet. Pile the Broccoli Rabe onto a rimmed baking sheet (I have one I use exclusively for roasting veggies). Sprinkle with salt and pepper. Put the baking sheet in the oven and let roast for 15 minutes (toss once during cooking). The stems and florets get beautifully carmelized. The leaves turn into little Broccoli Rabe potato chips. Un. B. Leev. Able. I like to do this dish with roasted chicken thighs. If you put one oven rack about halfway down in your oven and the other rack at the bottom, you can cook both the Broccoli Rabe and the chicken thighs at the same time. Sprinkle the thighs with your favorite seasoned salt and garlic powder. Put them in the oven on the rack in the halfway down position. Give them a 15 minute head start. Then put the Broccoli Rabe in the oven on the bottom rack for 15. They will finish at the same time. Add some crusty French bread and call that a gourmet meal.